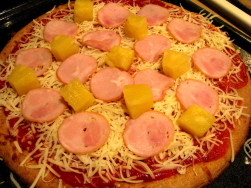 Low carb pizza can be made many different ways if you think outside the pizza box! Isn't that an oxymoron? Well, it doesn't have to be. While the crust is the foundation for a great pizza, it doesn't necessarily mean that the crust has to be a big, gooey slab of dough. You can get the great taste of pizza, without the carbs, by thinking a bit outside the "pizza box". If you're merely trying to cut down on carbs without cutting them out altogether, you might opt for a cracker thin crust or a whole wheat crust. Choosing whole wheat does make a difference. For example, a Boboli pizza crust has 32g of carbs in 1/6 of the pizza. The Boboli whole wheat crust has 22g of carbs in 1/6 of the pizza. Choosing whole wheat knocks off 10g in carbs. Definitely worth going with the whole wheat pizza crust (not to mention it is healthier and is a low fat pizza). Most people don't think of pizza sauce as being high in carbs, but believe it or not, some sauce is high in carbs. If you buy sauce in a jar, pay attention to the label. Try and find sauces with low sugar, such as Ragu's Homestyle Pizza Sauce, Trader Joe's Three Cheese Marinara or even Walmart's Great Value brand pizza sauce.